Assigned to the Nuremberg war trials, special agent James Cronley, Jr., finds himself fighting several wars at once, in the dramatic new Clandestine Operations novel about the birth of the Central Intelligence Agency and the Cold War. When Jim Cronley hears he's just won the Legion of Merit, he figures there's another shoe to drop, and it's a big one: he's out as Chief, DCI-Europe. His new assignments, however, couldn't be bigger: to protect the U.S. chief prosecutor in the Nuremberg trials from a rumored Soviet NKGB kidnapping, and to hunt down and dismantle the infamous Odessa, an organization dedicated to helping Nazi war criminals escape to South America. It doesn't take long for the first attempt on his life, and then the second. NKGB or Odessa? Who can tell? 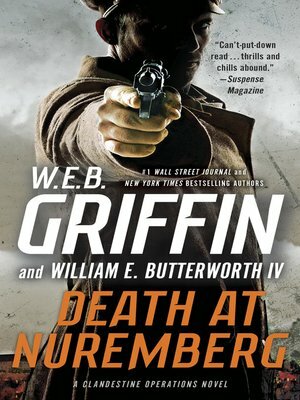 The deeper he pushes, the more secrets tumble out: a scheme to swap Nazi gold for currency, a religious cult organized around Himmler himself, an NKGB agent who is actually working for the Mossad, a German cousin who turns out to be more malevolent than he appears—and a distractingly attractive newspaperwoman who seems to be asking an awful lot of questions. Which one will turn out to be the most dangerous? Cronley wishes he knew.